Is there a charge to use Hamilton CapTel for PC/Mac? Are my calls confidential when using Hamilton CapTel for PC/Mac? Do I have to login on the web in order to use Hamilton CapTel for PC/Mac? Is there software I need to download in order to use Hamilton CapTel for PC/Mac? What hours are Hamilton CapTel for PC/Mac available? Hamilton does not provide traditional Captioned Telephone service in my state. Can I use Hamilton CapTel for PC/Mac? If I use Hamilton CapTel for PC/Mac, can I still use my traditional CapTel phone? I have Internet access on my cell phone. Will Hamilton CapTel for PC/Mac work there, too? Can I use Hamilton CapTel for PC/Mac in Spanish? Do I pay for long distance calls when using Hamilton CapTel for PC/Mac? Can I make international calls using Hamilton CapTel for PC/Mac? I’m experiencing difficulty connecting to Hamilton CapTel service. How do I know if there's a service interruption occurring? There is no charge for a Hamilton CapTel Account, or access to Hamilton CapTel for PC/Mac. All calls are kept strictly confidential. As required by law, CapTel CAs cannot disclose information from a Hamilton CapTel for PC/Mac conversation, nor are any records of Hamilton CapTel for PC/Mac conversations saved. There are NO records/documents/recordings of any conversation. Yes, you need to log into Hamilton CapTel for PC/Mac to place and receive captioned calls. No. Hamilton CapTel for PC/Mac is a web-based service and is used through your Internet browser. Hamilton CapTel for PC/Mac is available 24 hours a day, 7 days a week. There are no limits on the length of your calls or how many calls you make. Yes! Anyone who has access to an Internet enabled computer can register for a Hamilton CapTel Account and use Hamilton CapTel for PC/Mac service anywhere, anytime! Yes, your CapTel phone will continue to work as it always has. 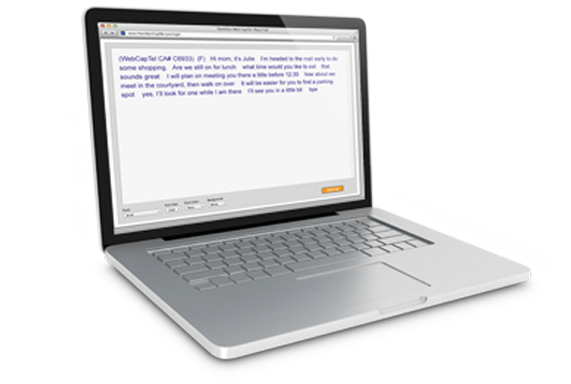 Hamilton CapTel for PC/Mac is an added option for accessing Captioned Telephone service. You can use your CapTel phone for the audio and Hamilton CapTel for PC/Mac for captions if needed. However, if you intend to use your CapTel phone with Hamilton CapTel for PC/Mac, make sure the caption button on the phone is turned off (the red light around the caption button). The Hamilton CapTel mobile app is available on select smartphones and tablets. Learn more about the mobile app for smartphones and tablets. Use the “forgot your password?” feature on the login page. Hamilton CapTel is available in Spanish between 7am to 11pm CT, 7 days a week. Spanish CapTel users must click the "Spanish" button on the call screen, or go to their profile and select Spanish as their language to receive captions in Spanish. Because you are accessing the service through the Internet, there are no long distance charges when using Hamilton CapTel for PC/Mac. Hamilton CapTel for PC/Mac is intended for use within the United States. How do I place a Hamilton CapTel for PC/Mac call? Can I add my extension to the “I’m at this number” box? Can I use my cell phone to place a call through Hamilton CapTel for PC/Mac? When I place a call to someone who has Caller ID, what will appear on their Caller ID when I call them using Hamilton CapTel? Full details on how to place calls using the Hamilton CapTel for PC/Mac can be found under “Placing Calls” in the Web CapTel User’s Guide. At this time Hamilton CapTel for PC/Mac does not allow extensions to be added to the phone number you’re using with the service. You can enter the 10-digit number you would like to dial to in the “Number to dial” field. When connected, you'll be able to listen while reading captions of the instructions and use your phone to enter numbers when prompted. Hamilton CapTel for PC/Mac includes a Contacts directory. You can add frequently called telephone numbers by logging into your account and clicking on the “Contacts” tab at the top of the Hamilton CapTel for PC/Mac page. You can make a call through Hamilton CapTel for PC/Mac using your cell phone as the voice line, as long as that is the telephone number you have entered in the “I’m at this number” box when logged on. Just remember that you must be logged into the Hamilton CapTel for PC/Mac call page on your computer in order to receive captions. If you have a Hamilton CapTel Call Me #, your Call Me # will appear in their Caller ID. If you do not have a Hamilton CapTel Call Me #, the phone number you are using to place the call with will appear in their Caller ID. How do I receive a captioned call using Hamilton CapTel for PC/Mac? What is a Call Me #? I already have a Hamilton CapTel account, how do I get a Call Me #? I don’t have a Hamilton CapTel Call Me #, can I still receive captioned calls on my PC/Mac? I have a Hamilton CapTel Call Me #, but I’m not logged in to a PC/Mac. What happens when someone tries to call my Call Me #? How will I know that I am receiving a call through Hamilton CapTel for PC/Mac? Can I browse the Internet while waiting for calls on Hamilton CapTel for PC/Mac? Full details on how to receive calls using the Hamilton CapTel for PC/Mac can be found under “Placing Calls” in the Web CapTel User’s Guide. The Hamilton CapTel Call Me # is a ten-digit number that allows you to receive captioned calls from family, friends and colleagues on your PC/Mac. With the Call Me #, individuals calling you can simply dial your Call Me # and reach you directly. Learn more about how it works in the Web CapTel User’s Guide. Simply log into your account and visit the Receive Calls section. Select the Hamilton CapTel Call Me # link to get your ten-digit number today! Yes, you can continue to receive calls. You must first enter and save a phone number in the “Receive Calls” section. The person calling you must first dial the toll free number 855-318-8818. At the prompt they will be asked to enter your telephone number and press #. Then, if you are logged on to the service through your PC/Mac, the call will automatically appear on your browser window, at the same time your voice telephone line rings. Answer the voice line, and your conversation can begin. If you have a smartphone and wish to receive captioned calls when away from your PC/Mac, download the free Hamilton CapTel App for your smartphone! All you have to do is log in with the Hamilton CapTel account that is associated with your Hamilton CapTel Call Me # and you will be able to receive captioned calls via the app. Now, family, friends and businesses simply dial your Call Me # to reach you. You need to be logged onto the Hamilton CapTel for PC/Mac site and have your web browser open. It’s important that you have a number saved in your account under “Receive Calls”. When you receive a call, your voice telephone will ring, and upon answering, the Hamilton CapTel for PC/Mac call screen will automatically display. Once you see (WebCapTel CA#xxxx with a call), your conversation can begin with captions displayed. Note: If you have minimized your browser with the call screen, you’ll need to maximize the window when you answer your telephone. Yes, just be sure that the page where you are logged into remains open. You may minimize the Hamilton CapTel for PC/Mac page when you are not on a call. When you receive a Hamilton CapTel for PC/Mac call, you will need to maximize the page in order to view captions. How does Caller ID work with Hamilton CapTel for PC/Mac? Can I save my Hamilton CapTel for PC/Mac conversation? Can I print my Hamilton CapTel for PC/Mac conversation? If you have a Hamilton CapTel Call Me #, the person you are calling will receive your Hamilton CapTel Call Me # information via Caller ID. If you do not have a Hamilton CapTel Call Me #, when making a Hamilton CapTel for PC/Mac call, the person you are calling will receive the telephone number you are using to talk on the phone (the number you entered in the “I’m at this number” field). After your conversation is completed, simply click on the “Save Call” button at the bottom of the screen. This will allow you to save your call into a file on your computer which you can access at any time. After your conversation is completed, simply click on the “Print Call” button at the bottom of the screen. Your print manager will then display on the screen so you may select your preferences and then click on “print”. This will print the captions along with the date/time of your call. Yes, the scroll feature works at any time during the call process. Disclaimer: Generally, Hamilton CapTel will work on the most recent version of the following operating systems, Internet browsers and devices. There may be older versions that are no longer supported and, in some instances, current versions that are not yet supported. Please review the following technical recommendations and contact Hamilton CapTel Customer Care if you have any questions about the compatibility of your system with Hamilton CapTel. Which computer and Operating Systems are recommended for Hamilton CapTel for PC/Mac? What Internet speed is required to use Hamilton CapTel for PC/Mac? Which Internet browsers are recommended for Hamilton CapTel for PC/Mac? When I access Hamilton CapTel for PC/Mac, I am prompted to install or update Java™. What do I do? The following operating systems are recommended, along with a compatible Internet browser. It is recommended that you run the latest available service pack or update for your operating system. Use of Hamilton CapTel for PC/Mac requires a reliable connection to the Internet via a broadband connection. It is recommended that you use the latest publicly available version of your preferred Internet browser as older versions may not support certain feature enhancements. Download and install the latest version of Java and you’ll be able to place and receive calls with Hamilton CapTel for PC/Mac.